NYT Bestseller Dr. Sara Gottfried explains why JJ’s process works. 5 Pounds In 1 Week! Kelly explains the ONE thing that finally helped her lose the weight. …says The Virgin Diet is essential for healthy thyroid function. 50 lbs & 8” GONE! Sugar Impact Diet succeeds where 30 years of yo-yo diets failed! Mary Jo inspired her husband & daughter, together they lost 67lbs. 53 pounds are gone and she’s eating and feeling better than ever! Energy up, allergies alleviated and up to 100 pounds lost. Listen now! Your body is not a bank account. 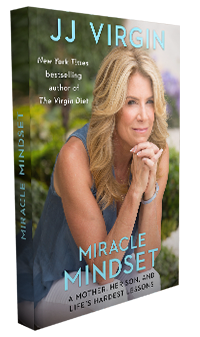 Celebrity nutrition expert and Fitness Hall of Famer JJ Virgin teaches clients how to eliminate food and carb intolerances and master their mindset so they can transform their health and their lives. As co-host of TLC’s Freaky Eaters and health expert on Dr. Phil, JJ is a prominent TV and media personality, including appearances on PBS, Dr. Oz, Rachael Ray, Access Hollywood, and the TODAY Show. JJ is the author of four NY Times bestsellers: The Virgin Diet, The Virgin Diet Cookbook, JJ Virgin’s Sugar Impact Diet, and JJ Virgin’s Sugar Impact Diet Cookbook. 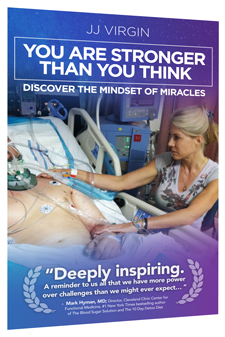 Her latest book, Miracle Mindset, shows warrior moms how to be strong, positive leaders for their families, while exploring the inspirational lessons JJ learned as she fought for her own son’s life. JJ hosts the popular JJ Virgin Lifestyle Show podcast and regularly writes for Huffington Post, Rodale Wellness, Mind Body Green and other major blogs and magazines. In addition to her work with nutrition and fitness, JJ is also a business coach and founded the premier health entrepreneur event and community, The Mindshare Summit.